Global measurements of a warming of the earth are more and more frightening. In recent weeks we have learnt that February 2017 was the second-warmest in NASA’s global temperature records that go back 137 years. The only warmer Februrary was last year. The hotspot has been the Arctic, which saw the hottest year on record with temperatures 40 above average in February. Arctic sea ice is seeing a record low winter maximum for three consecutive years. If all this sounds bad, hear this. The Himalaya is warming much faster than the rest of the planet’s surface. Even if countries meet or exceed their commitments for emission cutbacks, the average global temperature will still rise by 1.4o by 2100, but in the Himalaya, Pamir and Tibetan Plateau, temperatures will go up by 1.8.o The effects will be apocalyptic, and we are already seeing signs of it in Nepal’s glaciers thinning, retreating and losing mass at an alarming rate. Some of these trends were reviewed at an international conference on Understanding Climate Change and Climate Action this week in Kathmandu organised by the Nepal government with Kathmandu-based ICIMOD and the Intergovernmental Panel on Climate Change (IPCC). The IPCC has been cautious ever since its alarmist prediction ten years ago that Himalayan glaciers would all melt off by 2035 was proven to be unfounded. Even so, the new figures look serious enough. We are now looking at Nepal’s glaciers shrinking by half by 2050, and losing up to 80% of their ice by the end of the century. More than 1,000 glacial lakes have formed in the Nepal Himalaya alone as the ice melts, some of them are in danger of bursting. The trend is worse as we go west to east along the Himalayan arc. The mountains store an estimated 6,000 cubic km of water in the form of ice, and when it melts it will directly affect 1 billion farmers living downstream in South Asia, China and South-east Asia who grow food for nearly half of humanity. Countries in the region have argued that it is a problem created by the industrialised countries with their historic emissions of carbon dioxide, but India will soon become the largest emitter of greenhouse gases even though its per capita carbon output is small. 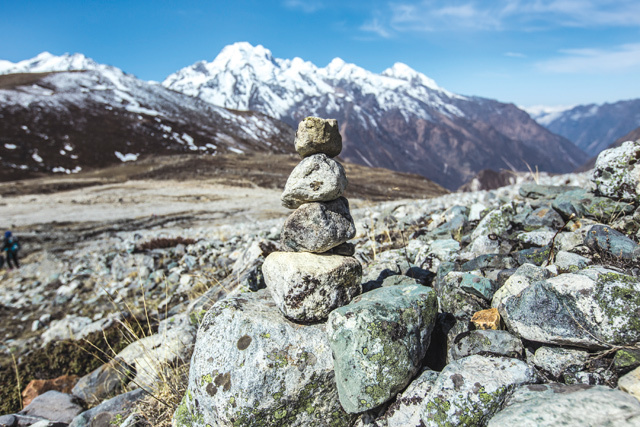 It may seem like Nepal’s minimal carbon footprint means we cannot do much to mitigate global warming, but we can act locally by reducing pollution, controlling forest fires and crop burning, upgrading traditional brick kilns, and improving public transport. Soot and dust particles cause Himalayan snowfields to melt much faster than they would with just global warming. Climate change is not a new problem, it is just making all our old problems worse. It is at the community level that Nepal needs to boost farmers’ capacity to cope with the change. Because pollution travels across national boundaries, controlling it also needs cross-border cooperation. Using cleaner, more-efficient energy has co-benefits for public health and the economy. Green is also the colour of money.